Reicks wins the 132-pound wrestleback to advance to the district tournament. Wrestleback at 132: Tom Reicks (TV) dec. Carter Matt (S-F), 12-5. 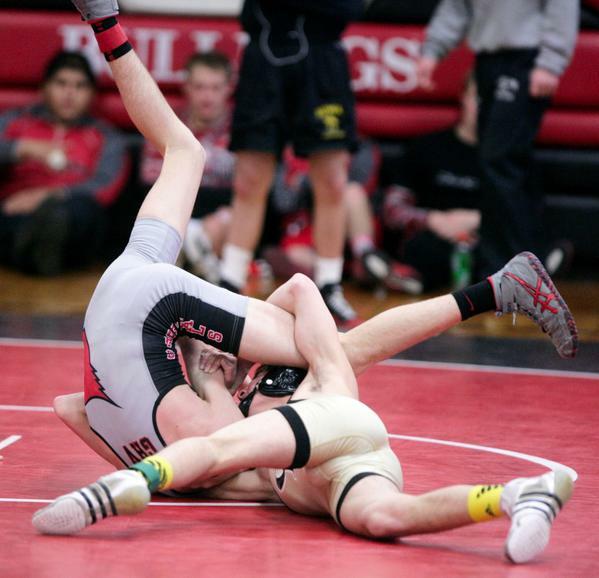 138 – Cale Reicks (TV) vs. Cutter Bruce (SA). Reicks TD, Bruce escape, Bruce TD for 3-2 lead after a period. Prestholt loses 3rd place match by fall, ending his freshman season. Reicks TD 6-5 he leads. Bruce reversal. He leads 7-6. Bruce holds on, literally, for a 7-6 win. Wrestleback at 138 – Cutter Bruce (SA) dec. Cale Reicks (TV), 7-6. 152 – Austin Janssen (NB) vs. Justin Kime (TV). Janssen 4-0 after one with 2NF to end the period. Kime TD 5-2, Janssen escape 6-2, Janssen TD 8-2. Janssen 2NF, leads 10-2 after two. 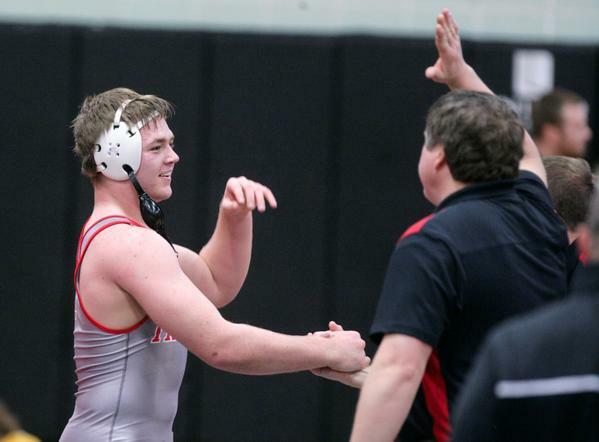 Team standings – Clear Lake 221, Iowa Falls-Alden 167.5, Forest City 161, Hampton-Dumont 154, Garner-Hayfield/Ventura 151, Algona 127. 106 – Dante Tacchia (IFA) pinned Austin Case (GHV), 2:32. 113 – Brennen Doebel (CL) pinned Todd Raisch (IFA), 1:14. 120 – Ryan Schmalen (CL) pinned Andrew Dornbier (GHV), 1:22. 126 – Ryan Leisure (CL) pinned Rubow (IFA), 1:30. 132 – Carter Barkema (HD) pinned Maverick Freerksen (FC), 1:34. 138 – Pierce Gelhaus (FC) major dec. Spencer Orr (CL), 13-1. 145 – Ryan Faught (CL) default Austin Lewis (FC). 152 – Max Lehmann (HD) dec. Luke Bahr (IFA), 9-6. 160 – Conner Shaw (GHV) dec. Josh Strohman (A), 6-4. 170 – Beau Sorenson (FC) pinned Cade Baker (GHV), 1:06. 182 – Joe Teague (A) pinned Miles Fristo (HD), :33. 195 – Ace Walton (CL) dec. Connor Smith (GHV), 3-2. 220 – Alex Paulson (FC) dec. Kendrick Suntken (HD), 3-1 (OT). 285 – Mario Pena (HD) dec. Chandler Holmes (A), 5-0. DPate loses by fall in wrestleback match to take 3rd place and close out his season. Hackett loses 5th place match to end his year. Mueller wins 2nd place with 3-0 decision and advances to District Tournament. Nettleton advances to District Tournament with an 8-4 decision in 2nd place match. Waters (1st-113), Mueller (2nd-138), Nettleton (2nd-152), and Fingalsen (1st-160) are the District Qualifiers next Saturday at SHamilton. CS finishes in 3rd place with 160 points behind Clarion-Goldfield (276.5) and Lake Mills (189.5). Clear Lake wrestling coach Gary Weber on Ace Walton: "If I had another daughter, I would want her to marry someone like Ace Walton." Where does the Hampton sectional go?